G-Park, available as both a free iPad app and a $1 iPhone app from PosiMotion, aims to prevent you from ever again feeling foolish as you wander around the mall parking lot, remote in hand, trying to find your car. Using your 3G-enabled device’s GPS, or Wi-Fi geolocation as needed, the app records the precise spot where you parked—as long as you remember to use it. A Walk in the Park: The iPhone version of G-Park gives you two options on its main screen—Park Me lets you log where you've parked (along with an optional button for taking notes or snapping a photo), while Where Did I Park? 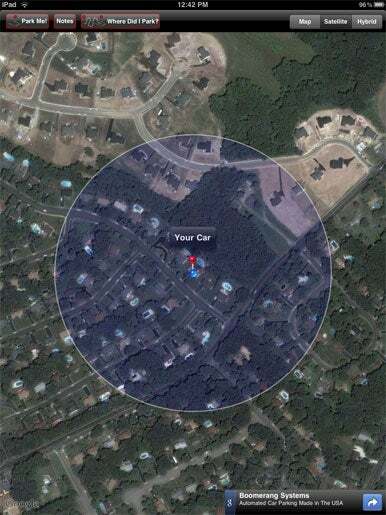 shows you the current location of both yourself and your car. An app as singularly focused as G-Park ought to have a simple interface, and indeed, G-Park’s austere main screen on the iPhone is limited to about two giant buttons and one tiny one. (The iPad version wisely combines all the app’s functionality into a single screen.) The first big button is marked Park Me! 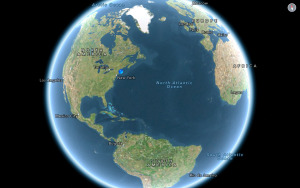 Tap it, and the screen flips over to show your current location. By default, the app cleverly uses Google’s hybrid map/satellite view to show you where you’ve marked your car. If you prefer, you can toggle to a pure map view instead. From this view, you can adjust the car’s exact spot if the iPhone’s attempt to geolocate your position is a bit off. But even if G-Park’s nailed your precise location on its own, you’ll still need to tap a second, smaller “Park Me” button again. Back at the main screen, you may optionally tap the small button: Take Photo/Add Notes. Instead of remembering that you’re parked in Purple Zone 6, snap a photo of the sign, or tap in the details. I found this feature frustrating, though. To save your notes, you need to tap the Save button at the top of the screen. If you tap the Back button at the bottom, when you’ve finished filling out the fields and have logically reached just that position, you’ll navigate away from your notes without having saved them. Saving notes (or a photo) also overwrites your last saved parking spot. That is, it encompasses the behavior of the Park Me! button. I’d prefer if the note-taking ability were built right into the main parking button; dividing it into two buttons strikes me as an odd design choice. Park Place: G-Park uses a hybrid satellite/map view to show you the location of your car relative to your position. When it’s time to find your again, you tap the main screen’s other big button: Where Did I Park? G-Park will show you that hybrid satellite/map view again with your current location—and your car’s—clearly marked. You can tap a button to call up your saved notes and photo. If the map view isn’t enough for you to find your car, G-Park provides a couple different ways to get you there. You can tap the compass button to get guided in the right direction, or you can tap a link to get step-by-step directions to your spot. That latter option actually exits G-Park and launches the Maps app instead. That’s the entirety of what G-Park does. If you tend to forget where you’ve left your car, G-Park should certainly be able to help; the app works as advertised. I imagine that if you’re reliant on Wi-Fi geolocation exclusively, the app can’t be nearly as useful. But if you’re using an iOS device with the ability to look up its location via GPS or cell tower triangulation, you should be all set. Frankly, though, I’m more interested in an app that can help me find my keys.